What English teacher hasn't used the classic reading journal? Whether they use a spiral notebook, loose-leaf, or composition notebook, the reading journal has been a timeless staple in language arts classrooms for the last twenty years. The Lit Blog is the new reading journal. I've found that Lit Blogs take the best qualities of the reading journal (low-stakes writing, thoughtful reading reflection, creative freedom) and amp things up for our current generation of students. 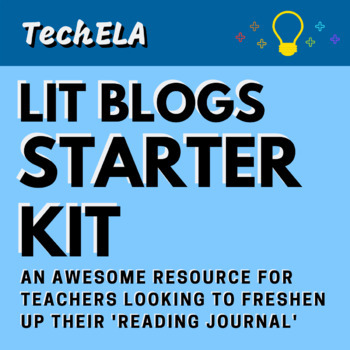 I've put together a basic starter kit to get your students blogging. The only thing you and your students need is access to Google Slides. For other teaching resources and tips, check out the Moody.Academy website. After purchasing, your download will only include ONE PDF. Don't panic! That PDF includes links to all resources via Google Drive. If your school does not have access to Google Drive, this is probably not the resource you are looking for.